For Harry, there is nothing better at this time of year than to have a good stick in his mouth and to kick up a pile of leaves. 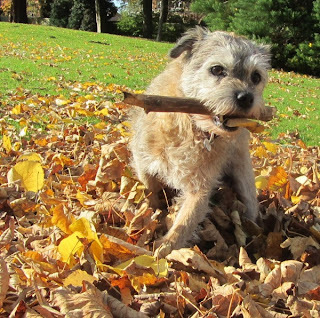 Lovely Fall picture, wonderful dog!! What a lovely little face! Hope you dont mind me contacting you, I'm trying to make a name for myself painting animal portraits. I've already been commisioned for a couple (take a peek at my website www.kirstynholgate.co.uk) but struggling to get my work seen by the masses. Which is where you may be able to help! If you send me your favorite picture of the lovely Harry, I'll do you a 20cm x 30cm painting for free if you'll include it in your blog?